I interviewed Manna Bahadur, author of the book The Curse of Nalanda. The Curse of Nalanda is a fictional crime thriller with an interesting plot around the Nalanda University. You can visit Book Review : The Curse of Nalanda - Manna Bahadur to read the complete review of the book. 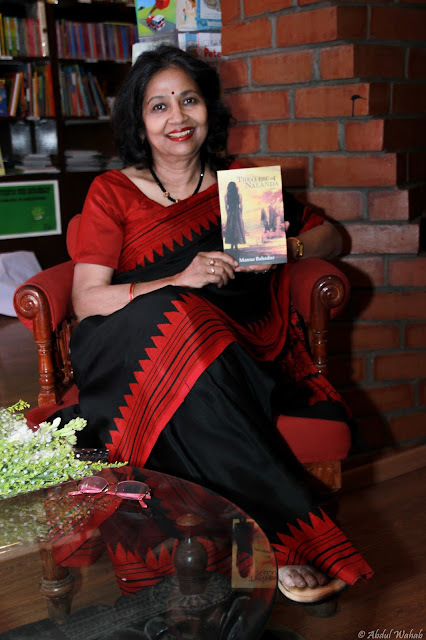 Q: How does it feel after “The Curse of Nalanda” being published? A: It is just like what a student feels when teacher hands over report card and mark sheet after exams. Every new feedback, comment, review, phone call, what’s app message is like grades doled out to me by different teachers or readers. So far it has been A+, Or 5/5 by all of them, so I can’t stop smiling. God is great. A: I love to soak in the freshness of greens around me, admire the colourful smile of blooming buds and flowers, love the vastness of the blue sky and the birds fleeting past, chirping away happily. But in today’s digital world, what’s app, Facebook and emails hardly give time to sit and stare and feel the warmth of nature. Other than this I paint, play harmonium and sing, do yoga and Pranayam, look after the household, entertain guests and I love spoiling my two little angels- Elisha and Amaira, my grand-daughters, to whom my book is dedicated. Q: Tell us something about your past work and what can we expect from you in the near future? A: I have published two more novels. ‘Neelanjana’ in Hindi published by Saransh Publishers in 2007. This is a light romantic comedy, kind of a stress buster which the readers enjoyed reading again and again. ‘`The Dance of Death’ is the second novel, published by Penguin India Ltd. This is a thriller based on a case in Patna High-Court that took place in seventies when the Emergency was in force, basically a fiction using a lot of imagination. This too was a best seller in 2012. Then I have published two books of poems ‘Aks mere jazbaat ke’ in 2006 and ‘Dhoop-Chaanh’ in 2009. I keep writing poetry whenever a thought flutters, arousing emotions to make my heart sing happy or sad notes. For my next book, I am still trying to find a theme that fires up my imagination well enough to start tapping the keyboard. Hopefully it should happen soon. A: I give full credit to my publisher Readomania for the cover. I had just given a concept and they excelled in projecting it. Isn’t it brilliant! It describes exactly what the story is all about? Q: What kind of research did you do while writing “The Curse of Nalanda”? A: My hometown is Patna which is not too far from Nalanda . I have been to Nalanda a number of times. Its topography and architecture is most fascinating. I Collected all the write up that was available there at the ruins, which is basically meant for tourists. It does not say much about its history. It needed a lot of guts and imagination to go back to an era which is not fully documented and write about it convincingly. History of Nalanda is otherwise available in Tibetan and Chinese languages which is luckily being translated and now available on the net, thanks to Wikipedia. Interview with Manna Bahadur, author of the book "The Curse Of Nalanda"
Q: How easy was it to complete the book? What kind of support did you receive from your family, publisher, etc.? A: I would never venture writing a fiction if it was difficult, or gave me tension. I have enjoyed writing every bit of it, lived through each and every character, their emotions, conversations, complicated situations and loved working out a plausible logical solution to their problems. We as a family support each other in whatever the other is doing, and we are each other’s harshest critic too, so before the world sees it, our fault has already been zoomed in and magnified by the family to take corrective steps. My family has shown excellent tolerance in letting me work late and long hours without complaining. I think I have been lucky to find a publisher who is totally supportive and helpful to the author with a calm and cool demeanour. He gives right suggestions and has ideas to make the work look best. I call Readomania the Beauty Parlour of manuscripts. They do the facial, make up and spruce up the manuscript before publishing and launching it in the market. A: The main story I would say is completely fictional, but a few incidents here and there are taken from real life situations. The character and story of Baba and his spiritual journey is drawn from one of my Uncle’s real life story where he acquired spiritual powers to heal those whom Doctors had given up on. He was a pious soul who cured many hopeless cases. An author always takes inspiration from some interesting anecdotes to make their story spicy and juicy. I am no exception. Q: How long did it take for you to complete the book? Did you ever face a writer’s block? How did you come out of it? A: The first draft was ready in about three months. After that I spent months in giving it frills and lace it up with right expressions and words. I like to revisit my manuscript after forgetting it completely for a long time; this way I am able to assess it objectively and rewrite where ever required. Normally revising the last few pages clears off writer’s block in me to put it back on track, but this time I faced writer’s block right at the end in finding the climax. My publisher Dipankar had accepted it with the original ending; but I expressed dissatisfaction. He just suggested to go back to Nalanda, and that did it. The story found its destination. Q: If “The Curse of Nalanda” is made into a Bollywood movie, which actors/actresses would you want to be a part of it? A: If ‘The Curse of Nalanda' is made into a movie, I would like to keep its cast a suspense till the movie is ready. Then I would hold a quiz asking people to guess the cast, and disclose them one by one to keep their curiosity on till the last day. A: Unfortunately, I do not read as much as I would like to. My all- time favourit book has been ‘The Day of the jackal’ by Frederick Forsyth, recently I liked ‘The Devotion of suspect X’ by a Japanese author Keigo Higashino and ‘The Kite Runner’ by Khaled Hosseini. ‘Mrityunjay’ by a Marathi author Shivaji Samant is another beautiful book that I keep suggesting to all. A: I prefer holding the traditional paper book in my hands to read. But the way technology has brought changes in our lives, can’t say about tomorrow. Q: Two things that you like and dislike about “Fiction”? A: If the fiction is interesting, I like everything about it, if it is not to my liking, then I am unable to finish it. Story and characterization is what draws my attention, if it is weak then my interest fizzles out. A: 'The Curse of Nalanda' is like a never before experience that will keep you hooked right till the last page. A: Life is a journey, you cannot reach its end unless you have touched and experienced all stations on the way. Enjoy every moment of this wonderful journey. A: My email ID is given in the last line of the’ Author’s Note’ in my book 'The Curse of Nalanda'. Please buy the book, read it and connect with me. Thank you. You can order a copy of the book, The Curse of Nalanda, from Amazon. Very interesting and inspiring. I could sense positivity in the author's answers.